Hemoptysis and pulmonary hemorrhage are rarely described as complications of cryoballoon ablation for pulmonary vein isolation (CB PVI). This study evaluated a large cohort to determine the frequency and risk factors for manifestation of these complications and assess the clinical relevance of hemoptysis after CB PVI. Seven hundred fifteen consecutive patients (351 female) from a single-center database were evaluated to identify those who developed hemoptysis after CB PVI. A total of 31 patients with hemoptysis (4.3%; 2 female, age 60.5 ± 11.5 years) were matched with a control group (n = 31). Hemoptysis developed within 72 h after CB PVI. 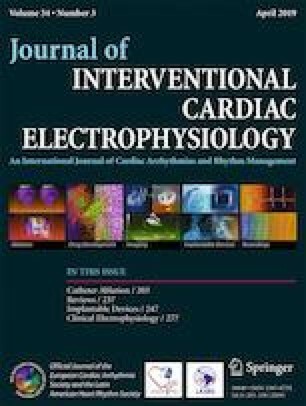 Cases versus controls had significantly lower ablation temperatures in the right inferior pulmonary vein (PV) (− 56.2 ± 26.6 vs − 49.1 ± 13.2 °C; p = 0.004) and left inferior PV (− 56.4 ± 11.9 vs − 47.2 ± 7.6 °C; p = 0.001). A trend to lower temperatures not reaching the level of significance was also found for the superior PV. All other procedural parameters were not significantly different between cases and controls. Although pre-procedural hemoglobin levels were comparable, post-procedural hemoglobin was lower in cases versus controls (12.9 ± 1.6 vs 13.7 ± 1.5 g/dL; p < 0.05). Twenty-six patients presenting with hemoptysis underwent chest CT scan, which showed perivenous infiltration at either the right (n = 23) or left inferior PV (n = 2) or no infiltrate (n = 1). No negative long-term effects were reported after 3, 6, and 12 months’ follow-up. Post-procedural hemoptysis after CB PVI is a relatively frequent finding and was associated with low freezing temperatures and pulmonary tissue infiltration predominantly located at the right inferior PV. Hemoptysis resolved without long-term sequelae. The study was approved by the ethics committee of the Ruhr-Universität Bochum, Sitz Bad Oeynhausen.